Learning how to gently stretch your Tripawd’s muscles after a short warm up walk can help keep your dog limber, avoid injury and alleviate tension. But do you know the right way to stretch your Tripawd? Before attempting any stretching exercises, do a warm up with your your dog to avoid injury during these stretching manuevers. Begin with an easy walk of just a few minutes, or if the weather is bad, play a fun indoor game of tug or hide and seek. This simple nose to hip “cookie stretch’ video is another easy maneuver you can do together. Please use extreme caution when performing these movements or any other exercises. Always watch for signs that your dog has had enough. 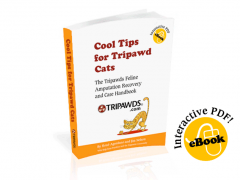 Did you know: the second Tripawds e-book, Loving Life on Three Legs, has tons of detailed information and photos that will teach you how to stretch your Tripawd, keep fit and stay strong for life. When attempting any kinds of new fitness routine, remember: use common sense, don’t push too hard and remember to give lots of praise and rewards afterward so your dog associates these activities with “fun” and not pain. 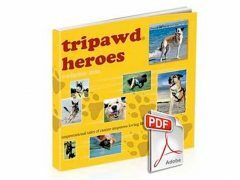 Please consult with your veterinarian or a certified canine rehabilitation therapist before beginning any fitness program for your Tripawd.